This was my first attempt of using transparent plastic for doll shoes. These are for Monster High dolls. The plastic needs to be that soft and pliable, slightly stretchy variant. The piece I used was from a protective cover of a calendar, I think. 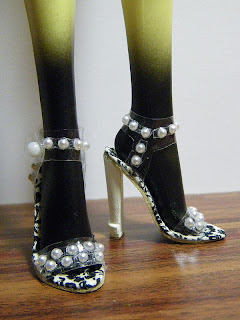 The Create a Monster legs can be very handy for making shoes for the dolls, because they are easier to handle than the entire doll and more durable than plaster castings. The rows of pearls are sticker strips, which are easier to handle than separate stickers. I started by making patterns for the required parts. Then I made the insoles from two layers of cardboard and glued fabric on top. This photo shows one finished insole and the other one waiting for some more gluing. Cutting the upper pieces from plastic was a bit tricky as the patterns kept slipping from the plastic. I finally managed to cut all parts, but photographing them was the next challenge. I didn't want totally transparent uppers, so I glued some pearls to the pieces. Then I applied sealer to make sure the stickers won't fall off. Here are the pieces waiting for the sealer to dry. When the pieces were dry, I used some double-sided adhesive tape to attach the ankle strap bottoms to each other. Then I made a hole to the part where they overlap. The toe straps also got tape and holes for the reason explained below. Although double-sided tape is quite good at keeping the plastic pieces in place temporarily while you haven't glued the outer sole in place yet, I didn't trust it to be a permanent solution. That is why I made the holes in the plastic pieces. The holes need to go through the plastic and any tape there might be, so that when you glue the outer sole in place, it and the cardboard sole will be glued directly to each other in the places where the holes are. These "plugs" will stop the plastic pieces from sliding anywhere, especially as the outer sole and cardboard sole will be glued to each other on both sides of the plastic pieces. So, the plastic is locked in the correct position and cannot move anywhere. For closing the ankle strap, I attached a small bead to the other side and made a hole to the end of the strap going across the ankle. I used transparent thread for the bead and secured the knot with glue. This is the construction after gluing the outer soles in place. My uncle left a big stash of wooden cigarrette holders and I've been finding various uses for them. This time I decided to try using them for heels. I sawed and cut them to a suitable shape and used cardboard to close all openings. Before gluing the top shut, I actually filled the heels with sand to help them keep their shape. Then I glued the heels in place and painted them. Here are the shoes on my custom Create a Monster doll "Bee." wonderful!! i love the fabric for the insoles and the idea of using the wooden cigarettes holders!! Amazing job! I am always inspired to try shoe making again after seeing your work.